DECEMBER 8, 2015 - MAUNAKEA, Hawaii – Hawaii’s W. M. Keck Observatory has successfully deployed a $4 million laser system that provides a marked increase in the resolution and clarity of what are already the most scientifically productive telescopes on Earth. The new laser was projected on the sky for the first time on the evening of December 1, 2015 and will allow scientists from around the world to observe the heavens above Maunakea in unprecedented detail. “The Next Generation Laser System is the third generation of lasers at Keck Observatory, which has been pioneering Laser Guide Star Adaptive Optics on big telescopes since 2001,” said Jason Chin, the project manager for the new laser at Keck Observatory. The first Laser Guide Star Adaptive Optics system on a large telescope was commissioned on the Keck II telescope in 2004 and, among many other firsts, helped reveal the black hole at the center of the Milky Way – one the most significant astronomical discoveries. The second laser system was installed in 2011 on the Keck I telescope, propelling Keck Observatory’s lead as the premiere Adaptive Optics research facility in the world. To date more than 240 science results from these laser systems have been published in astronomical journals. CREDIT: W. M. KECK OBSERVATORY - Image from the launching point of the telescope looking up into the night sky. The central hole in the beam is due to the secondary mirror obscuration on the laser beam launch telescope and is used to align the laser beam. Keck Observatory’s Laser Guide Star systems create an artificial star in the earth’s mesosphere, at an altitude of roughly 60 miles, by energizing a naturally occurring layer of sodium atoms, causing them to spontaneously emit light (or glow like a star). The adaptive optics system uses this artificial laser guide star to measure the aberrations introduced by turbulence in the earth’s atmosphere. A six-inch diameter deformable mirror with 349 actuators is then used to correct for these aberrations at a rate of 1,000 times per second, effectively taking the twinkle out of the stars and providing near-perfect detail for planets, stars and galaxies. Combined with the 10-meter diameter primary mirror, Keck Observatory can offer images with five times the resolution of even the Hubble Space Telescope. The new laser is the result of a collaboration between Keck Observatory and the European Southern Observatory to develop a more efficient and powerful facility class, commercial laser for astronomy. The new laser, fabricated by TOPTICA in Germany and MPBC in Canada meets both goals handily: the power consumption on the new system is down to 1.2 kW from the previous 80 kW used by the former dye laser system while performance has increased by a factor of ten. Further, the new laser can transition from off to an operational state in five minutes – a dramatic improvement over the five to six hours for the dye laser, which was decommissioned in October to make room for the new laser. Perhaps most significantly, this is first of the new generation of lasers that all future telescopes are planning on and are looking to Hawaii’s findings to build their systems. CREDIT: W. M. KECK OBSERVATORY - These plots show the symmetry of the artificially created guide star in the mesosphere. Funding for the project came from the Gordon and Betty Moore Foundation, the W. M. Keck Foundation and Friends of Keck Observatory. Initial seed funding was provided by the National Science Foundation. More than one-third of the budget was spent in Hawaii designing and installing the systems and related infrastructure to support and operate the new laser. 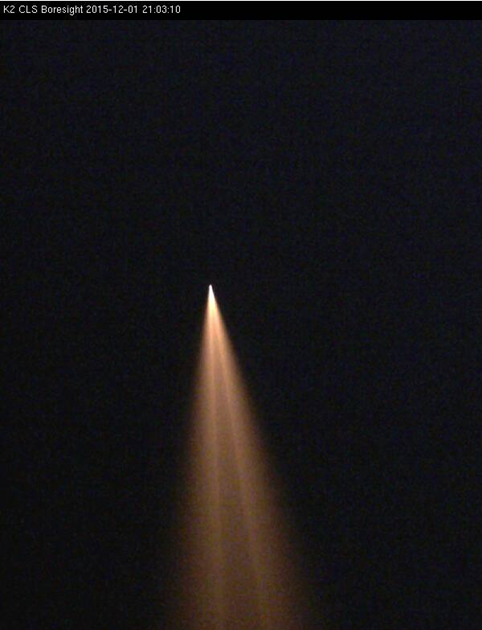 The remaining budget was spent on the laser itself – more than $2.5 million. The project also provided infrastructure for adding two additional lasers to support laser tomography in order to determine the distribution of atmospheric turbulence versus altitude. Once funded, the additional lasers can be easily added to the system and would allow a much larger area of the sky to be sampled with even better correction of the atmospheric turbulence. The W. M. Keck Observatory operates the largest, most scientifically productive telescopes on Earth. The two, 10-meter optical/infrared telescopes near the summit of Maunakea on the Island of Hawaii feature a suite of advanced instruments including imagers, multi-object spectrographs, high-resolution spectrographs, integral-field spectrographs and world-leading laser guide star adaptive optics systems.